Every scoring target is usually shot twice, unless otherwise noted in the course description. Brown cardboard targets are the scoring targets. Black targets are "hard cover". If you shoot a black target there is no penalty, but you also do not get points for hitting a target down range from shooting through a black target. If you shoot just a portion of a black target your target hit down range will count. A penalty will result from hitting the white targets called "no shoots". Missing a target is referred to as a "Mike" and is a penalty of 10 points. Hitting a white "No-Shoot" target is worth the same 10 point penalty. Mikes and No-Shoots are the most common scoring penalties and some of the easiest to avoid. Shoot as fast as your sights allow you to shoot and be sure of every shot you break. Being a little slower with good hits and no Mike or No-Shoot penalties will serve you well for match scores even though you feel you are shooting slowly. These happen when you make a procedural mistake such as failing to engage a target, failing to follow the course description (missing a mandatory reload for example) or engaging a target while having stepped past a fault line. Many times these are the mental mistakes that can hurt your score when you aren't paying close enough attention. This is a thinking sport as well as a physical one so keep your head in the game so you don't receive one of these 10 point penalties. Targets are broken down into sections. Scoring is based on the hole in the target caused by the bullet and scoring is in the favor of the shooter. By that I mean all you have to do is touch the line of a scoring zone to be awarded that point value. There is also a scoring line surrounding the entire target edge that identically defines each target's maximum outer border. Just clipping the edge of the target won't score a D zone hit unless you touch this outer edge perforation. 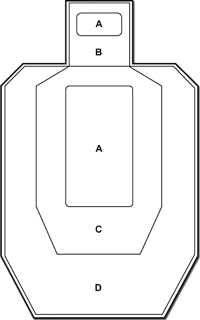 The "A" zone is worth the most points, "B" and "C" zones are of equal value, followed by the "D" zone, which is the minimum number of points. 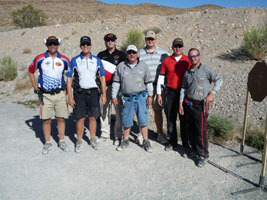 In USPSA, you do well by earning the most points in the least amount of time. Your score is had by adding the number of points you earn together, divided by your time. This gives you a number called your "hit factor". The person with the highest hit factor (points per second) wins the stage.